We’re already a month into the new year, are you sticking to your New Years Resolution still? If like most of us, you chose fitness as your resolution, there’s a good chance you may already be struggling at this point. Statistics show that a lot of us tend to slack off by February (especially more so when our resolutions are related to health and fitness) and then its a downward slope from there the rest of the year! I put on weight several years ago and that was when I decided I needed to make fitness a part of my daily routine. A decade later, I’ve kept the weight off and still work out fairly regularly. I get asked how I’m able to workout consistently all the time. What I’ve found is that by sticking to a routine for working out, really seems to help me best. Especially doing it first thing in the morning before you have all day to talk yourself out of it. The other thing I’ve found that works well to sticking to your fitness goals, is changing up the workouts. Boredom is the quickest way to give up on that fitness program. Not only that, but most people don’t realize that doing the same workout over and over will bore your muscles as well, and you won’t get much benefit from your same old workout anymore. I’ve had gym memberships over the years, but for me, I just found that it saved me so much more time and energy to just workout from home. A lot of us probably chock up the missed workouts to not having the time to do them, right? I know so many of us women lead such busy, hectic lives, even thinking about getting a workout in 3-4 days a week seems like such a daunting task. Even if we do have the time to workout from home, a lot of us don’t want to, or are unable to buy the super expensive treadmills, elipticals, etc. Well ladies, I have a great solution to all of these problems that are probably keeping you from keeping your resolution to get fit this year! I recently came across the Fe Fit 13 week, 90 Day Workout Program, you can do from home, and it’s completely changing my workouts and fitness routine for the better! Fe Fit is a fitness program designed to help you shed pounds, build muscle, tone and tighten that body, and it will cost you a lot less than that expensive gym membership this year! Now I know what you’re thinking, yeah there are lots of dvd workout programs, what makes this one so special? Well, over the last decade of working out from home, you can bet I’ve accumulated quite the library of workout dvd’s and fitness programs, and let me assure you, I can spot a winner when I see one! And Fe Fit is it! Yep, I’ve used a lot of workout dvd’s over the years and you bet most of them get put on the shelf never to be used again. What I’ve found is that most are two beginner or slow paced. And the ones that aren’t, are usually way too much to keep up with. 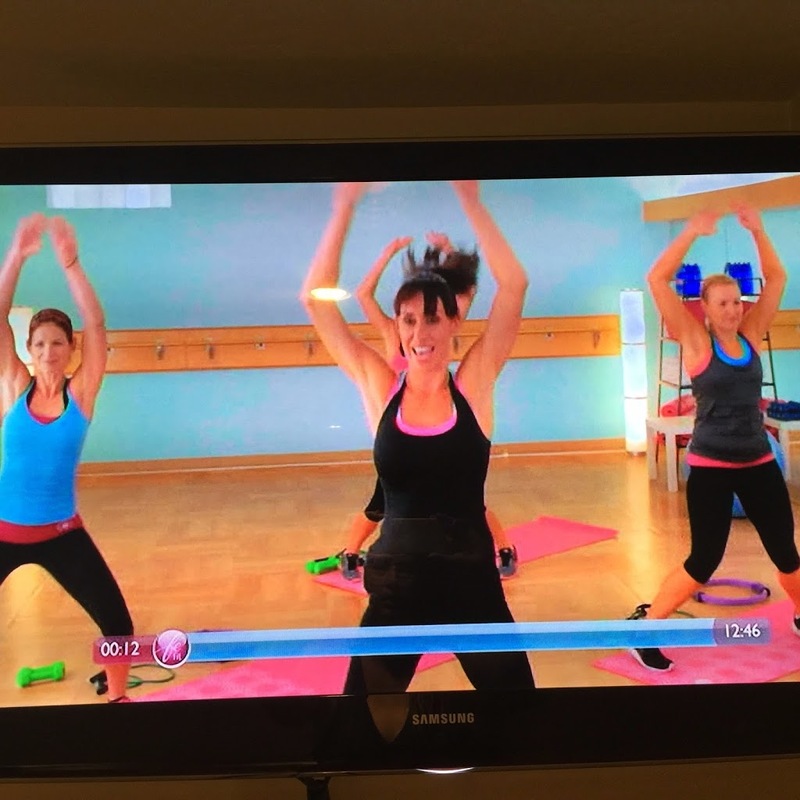 What I love about Fe Fit is that it a great moderately paced serious of workouts, but they also have great options in each video for the beginner or the more advanced exerciser. This way, you can find a perfect level for each workout. Also, my other issues with workout DVD’s are that you buy one for $15 and its the same workout over and over. When you do this workout more than once every few months, your muscles and YOU get bored, and you basically start to get absolutely nothing out of your workout anymore and are pretty much just wasting your time. 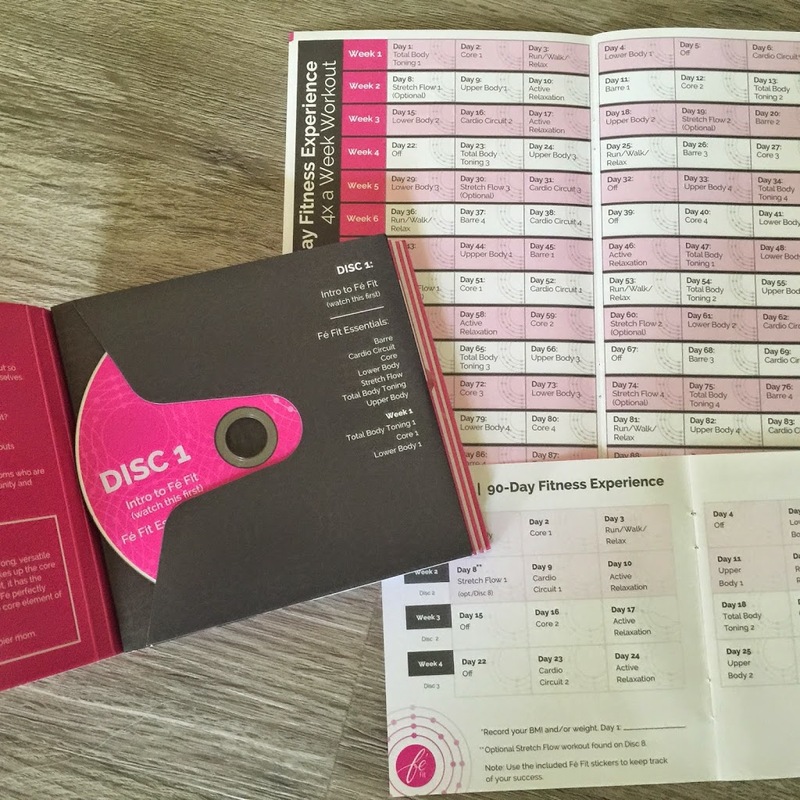 The Fe Fit comes with a whopping 8 discs, that each have over 4-6 workouts on each DVD. You get 28 workouts with this fitness program! Each workout is completely different so you won’t be bored and neither will your muscles and body! Also, if you’re motivated by tracking progress, you will love that your Fe Fit workout series comes with a 90 day calendar to track your workouts each day. 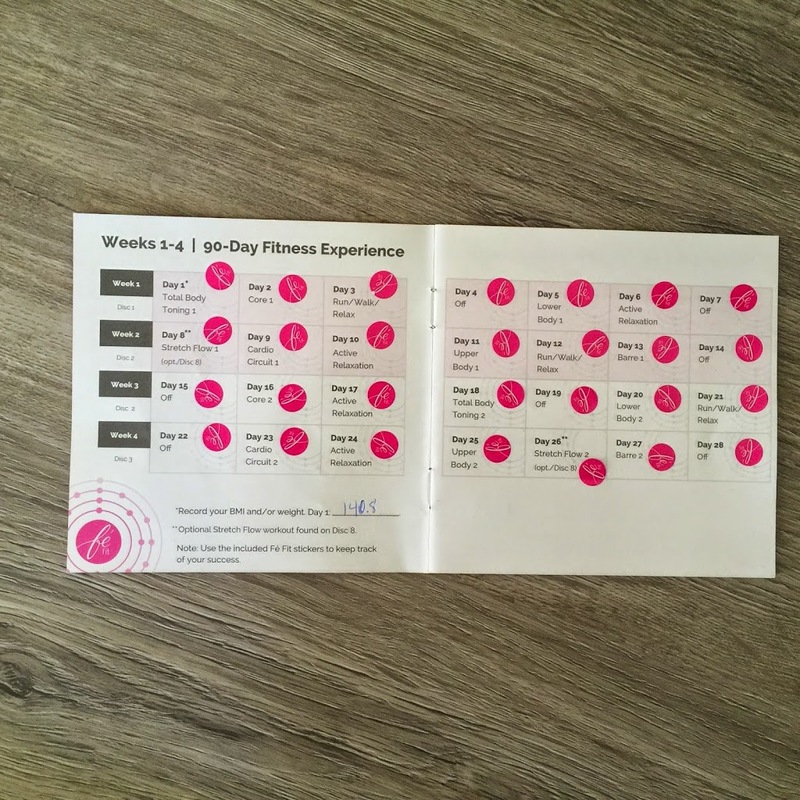 It also comes with stickers you can place on the calendar each day you’ve completed your workout. You can also use the user guide to track your weight and measurements at the beginning of your program, 30 days though it, 60 days, and after 90 days, so you can really see your progress. Over the last 30 days, I got to try out this workout and really put it to the test. Don’t worry if you don’t have a lot of fitness equipment. You only need a mat, some weights (3 or 5 lbs) a pilates circle (or a ball you can squeeze, that may have lying around your house) a chair, and a resistance band. I happened to have all of these except the ball, so I did pick up a pilates circle for about $10. 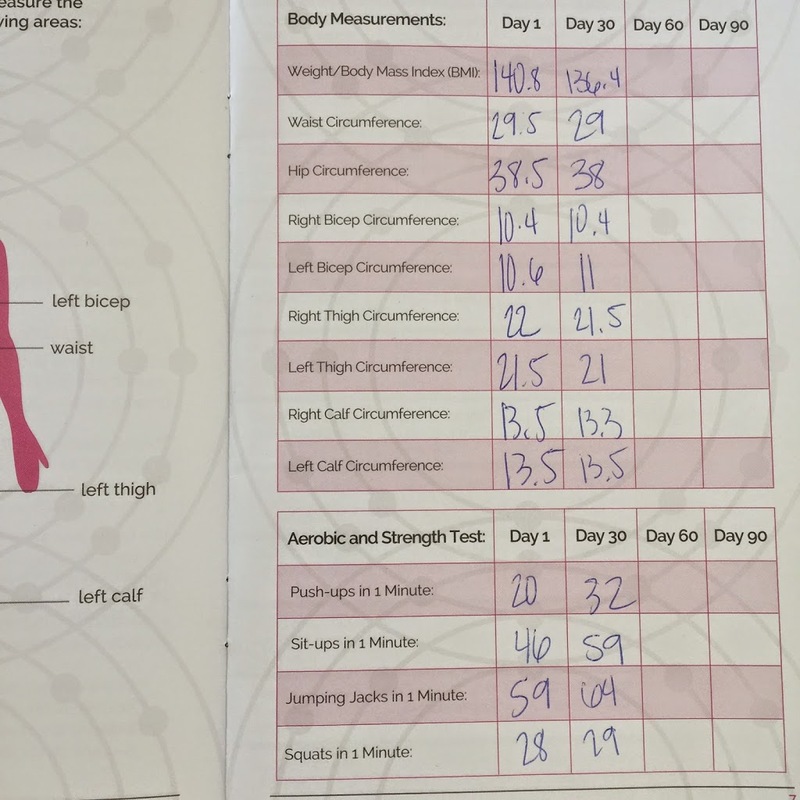 On the first day, I took my measurements as well as my aerobic and strength test, which consists of how many pushups, crunches, squats, and jumping jacks you can each do in a minute. Then I popped in the first video and went to work! If you’re short on time, you will love that the Fe Fit program only requires 30 minutes a day, 3-4 days a week. This is the amount of time each of us should workout in a week anyway, but if you can’t stand long hour long workouts, you will love how quickly the 30 minute workout goes by! The workouts are completely different each day. After a month long of working out, I have found that most videos incorporate a lot of new moves so you’re muscles certainly won’t get bored. I also learned completely new moves I’ve never even done before to target some problem areas! The programs provide you with a lot of variety. You will even find cardio, stretch, and barre workouts on these dvd’s. I had actually never done Barre before but heard lots of good about them, so I was really excited to try them! Boy, I can tell you, they are a workout, but they feel really good! I also found moves in this program that I had previously only found on really expensive workout programs I had paid over $200 for, for only a couple dvd’s! I really enjoyed and looked forward to doing my workouts with my Fe Fit program 3 times a week. The instructor in the video is completely infectious and great at motivating you to push through some of the harder, more intense workouts. I love that there is a fitness level for everyone, but you will be amazed at how much of a good workout you get out of these videos. It’s easy to work up a sweat with these dvd’s and I felt sore after almost every workout I did, and I consider myself in pretty good shape! Again, if you’re a beginner and this intimidates you, don’t worry! Each move, the instructor will give you a modified version so it is easier for you to do, until your muscles can adjust and you can work your way up to the moderate level or even the more advanced level! Over the last 30 days, I have really enjoyed the program and have absolutely loved the workouts! My body feels great, is looking good, and I feel like I’m doing myself some good by getting in new workouts instead of sticking with the same old workout I’ve been doing the last year that is really getting my body no where! As you can see here, I tracked my progress for the month by adding a sticker every time I completed the workout. I actually found this to be quite motivating for me. I really wanted to be able to add those three stickers each week! I even did a stretch workout this last Sunday to make sure I got my sticker, when I usually always reserve my weekends for relaxation days. After completing my 30 days, It was time to measure myself and do my aerobic fitness and strength test. I’ll be honest, I thought to myself, this will be a waste of time. There is no way I’ve improved in 30 days, especially since I’ve already been working out regularly for the last 10 years! But guess what ladies? I did in fact see some changes in my body! As you can see here, I dropped 4 pounds! What?! I didn’t weigh myself all month but I was not expecting that! (Let it be noted that I am at my goal weight and am not looking to lose weight with this program, but to tone my body and get more definition). I started at 140 and was 136 after 30 days! Not only that, but I lost a half inch on my waist and hip, as well as my thighs too! My left bicep also got a half inch bigger! I thought for sure the aerobic and strength test wouldn’t show any difference at all, but it did! I did 12 more push ups in a minute than I did when I started the program 30 days ago! I was also able to do 13 more sit ups, 5 more jumping jacks, and 1 more squat! Well the results pretty much say it all, don’t they?! And that is just after 30 days! I still have 60 days more to go! I can go on and on about this program, because I know you will love it too! It works amazingly well, even for those of you, who like me, have already been working out regularly for years. It is fabulous and motivating, and will not bore you whatsoever, thanks to the 28 different workouts! Each workout works for you no matter what fitness level you are at, and after using it for months or years, you will still be able to push yourself harder. I consider myself a more advanced exerciser but I found I was falling in the moderate category each workout. I still have a long ways to go to get to the more advanced modifications you will find in the Fe Fit Fitness program. You can also save yourself a ton of money by forgoing the gym membership, and you won’t need expensive fitness equipment to do this program either! 30 minutes a day, 3 times a week, is all you need to achieve the body of your dreams! I am so thrilled with my 30 day results, I can’t wait to see where my body will be at after 90 days! Don’t give up your fitness resolution yet! Fe Fit is the perfect resolution to obtaining your resolution this year! If you would like to learn more about the Fe Fit fitness program, you can shop them on Amazon HERE. * I was given this product for the purpose of review from Fe Fit and Tomoson.com . However, all thoughts and opinions expressed in this post are solely my own. I only share reviews with my readers, I feel will be beneficial or informative in some way. Ahh the holidays, the lights, the jolly tunes, spending time with loved ones, and the food! Oh… the food… Yeah, unfortunately, holiday food can be killer. The sugary sweets, the super buttery and unfortunately uber-fattening comfort foods. Unfortunately, the holidays are about one of the quickest wrecks to any diet. It’s no wonder New Years, and Health and Weight-loss Resolutions quickly follow Christmas! Luckily just because the holidays are here and it seems impossible to say no to all that yummy food, doesn’t mean you can’t still enjoy what you love (within reason of course!) and still lose some weight! 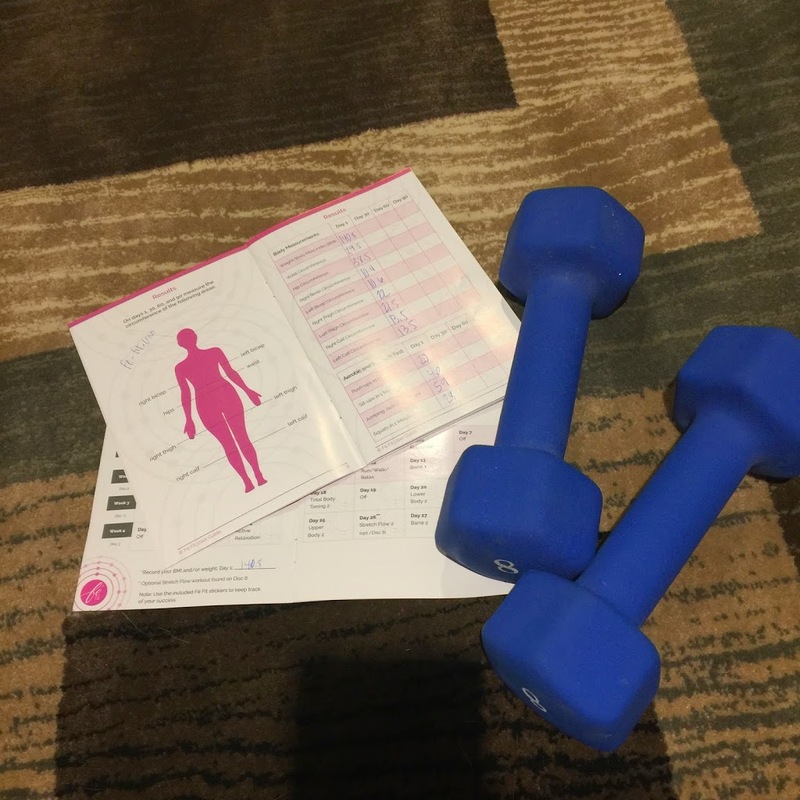 If you’ve been reading my blog long, you know that I find health and fitness very important and really try my best to exercise regularly and maintain my weight. I am certainly a foodie, and you can bet this time of year is extra hard for me. I’ve learned there are certain foods I just can’t keep in the house, and that baking is completely out of the question for me because I will eat that whole batch of cookies, usually within a day or two of making them! Luckily, there are fabulous supplements on the market now that can really help you maintain or lose weight, even during the holidays. I’ve tried several different supplements this last year, but happily found my hands-down favorite choice recently when I tried CLA Superior. There are tons of weight loss supplements out there, and sometimes it can be daunting and hard to choose, which is why I always find recommendations from others most helpful. Unfortunately, I hadn’t heard of this supplement before but was excited to try it out when I read that CLA can help you burn fat, reduce your waist size, promote muscle growth, give you better overall health, as well as help increase your metabolism. It seems like most supplements on the market only decrease your appetite, so I was thrilled to see that CLA offers so many other aiding factors to help you shed those dreaded extra 10 pounds! Also, what I didn’t realize is that many fat burners on the market only work for about 3-4 weeks, then you need to take a break. CLA actually works fabulously when taken continuously with no breaks. 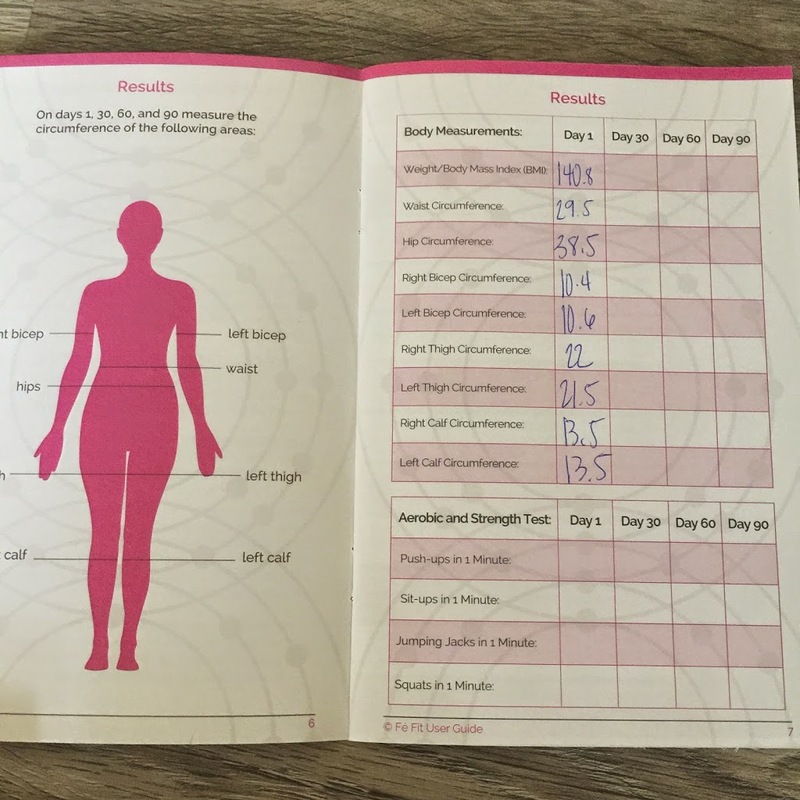 You need about three weeks to see results, so I tried out this product for the last month to really see what It could do for me! The way CLA works is that it will aid the transport of fat into mitochondria of cells, where it is then burned as fuel. When burned here, it will also keep the body from storing more fat. The amount of fat the body is burning is then increased substantially, and also spares the muscles from breaking down. When your muscles are spared, your metabolism increases, which in turn further increases the speed at which you lose weight. CLA is safe, healthy, and effective. It comes from natural safflower oil made from the purest quality. What I didn’t realize is that CLA is absolutely needed in the diet and most of us aren’t getting enough. Ideally we each should be getting 3 grams of CLA per day, which means you would need to consume more than 7 pounds of beef in a day! Obviously, most of us are not getting that, so it makes sense that adding CLA to our diet can become very beneficial to aiding in weight loss. CLA Superior contains 80% of pure CLA, which is the highest amount you will find available on the market today. It also meets the FDA standard and each ingredient is issued a certificate of analysis, so you know you are getting a safe, and healthy product. It is also made right here in the USA and extensive testing is done on each batch of product to make sure it is safe and effective! When my CLA Superior supplements arrived, I couldn’t wait to try it out! I took two capsules first thing in the morning and then two more again at lunch, everyday for the last month. I missed a few times but for the most part did pretty good at remembering to take them. I also combined it with healthy eating (for the most part, I did have Thanksgiving over this period!) as well as trying to work out regularly. I noticed when juicing while taking this product that my stomach felt nearly flat too, and no bloating, which is huge for me. I seem to experience a lot of bloating from most food, and I know that Juicing helps me feel better, but it seemed my stomach felt even much flatter than normal while juicing in combination with taking CLA Superior. I also weighed myself in the beginning and actually lost about 3 pounds this month. I’m actually at my goal weight so I’m not trying to lose weight, just maintain it, especially over the holidays, so I was actually really thrilled to see this number when I stepped on the scale today. Especially because I just returned from a trip to Las Vegas on Sunday, where I gorged myself on some amazing food for 4 days! Overall, I’ve had amazing benefits using this product. While I tend to not pay much attention to the scale, but mostly to how I feel and how well my clothes fit. I noticed that some of my tighter jeans have felt a little looser, even after Thanksgiving and a total foodie vacation this last week! I’ve been slacking on my workouts the last few weeks so I was thrilled to see that instead of gaining weight and my clothes fitting tighter, they’ve actually felt looser and I’ve shed a couple of pounds! I’m actually amazed and somewhat dumbfounded by these results! This is certainly a product I will be using for years to come! One thing I absolutely have to mention too is that CLA will not affect your mood in anyway! I’ve been using Garcinia Cambogia a bit this year and found that the stuff totally puts me on edge and I’m quick to anger. I experienced absolutely nothing like that while using CLA Superior. My mood stayed completely neutral, and I didn’t experience anything out of the ordinary, except that my body felt better, looked better, and the product helped me stay on track to maintaining my weight over the holidays! 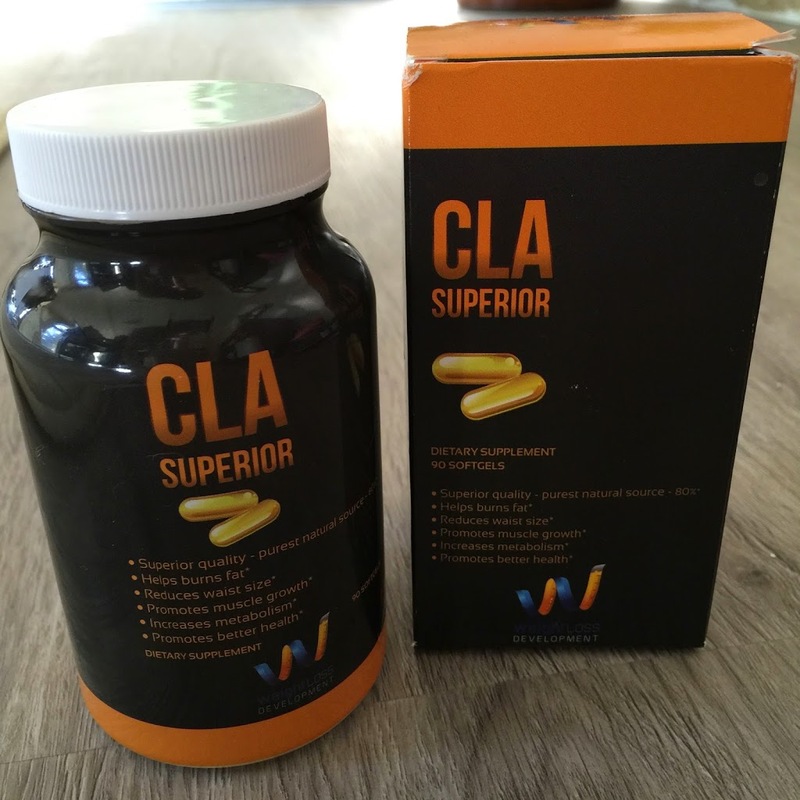 If you would like to purchase CLA Superior for yourself, you can find them on Amazon and pick up a 30 day supply for only $28! 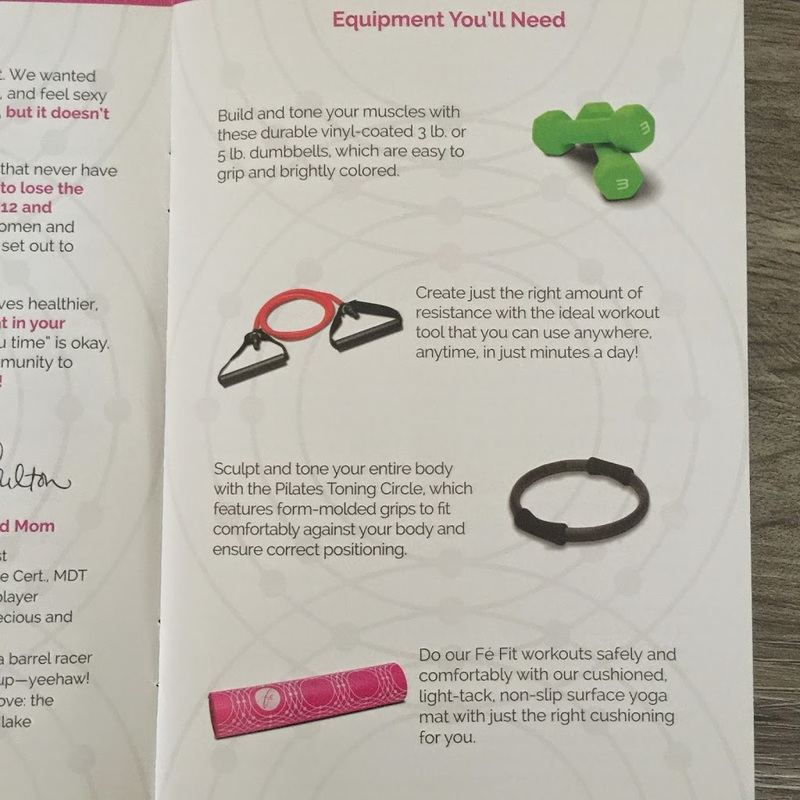 The product also comes with a 100% Satisfaction Guarantee, as well as a FREE weight-loss guide E-book, and a 30 day ticket to their concierge program, where you can get FREE expert advice from personal trainers and nutritionists to help you on your weight-loss journey! 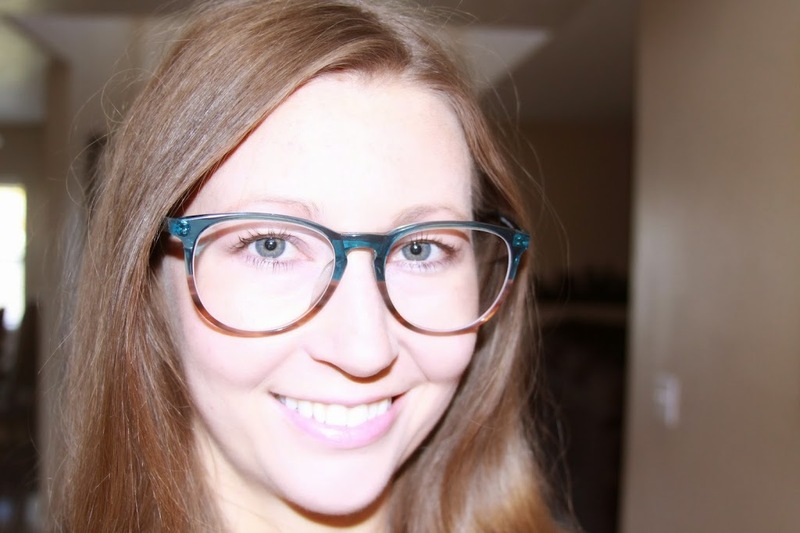 I change up my style of glasses like I change up my shoes, so I need inexpensive on-trend styles that won’t break the bank, but will able to me to change up my look often! Anyone who unfortunately has bad eyes like I do, and wears glasses, knows that most of the time it’s going to cost you an arm and a leg for those new frames and lenses. In the beginning I only bought glasses from my eye doctor and because they cost $200-$300 each, you can bet I was wearing only one pair until they broke and I unfortunately had to go back and buy another pair. Gone are the days of buying expensive lenses and frames. With wonderful little online shops popping up, such as Firmoo.com, you can buy incredibly inexpensive, on-trend frames whenever your little heart desires! In fact, most frames and lenses are around only $30 total! You really can buy glasses like shoes now and switch them in and out with whatever outfit you are wearing for the day! 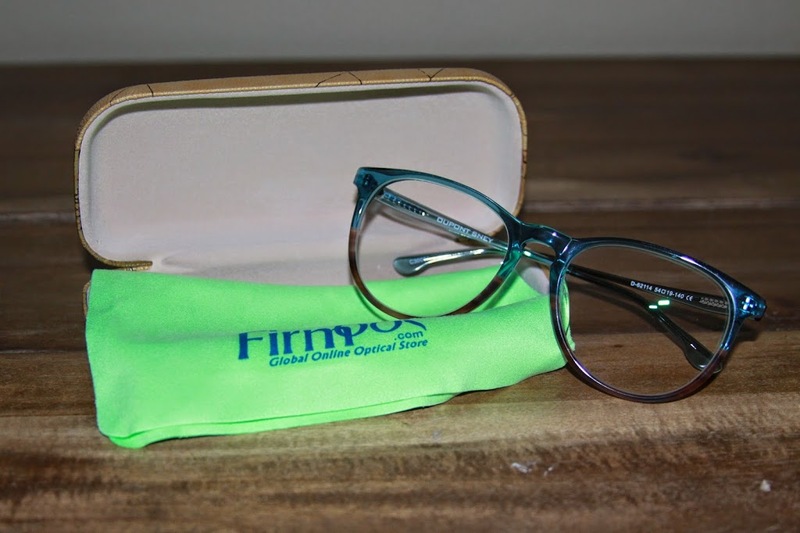 Firmoo is constantly updating their stock with glasses so it’s easy to find a pair or two you will love. I’m constantly searching the site when a new style of frame comes back in. For example, a few years ago I was getting the big thick black frames because those big frames were having a moment. 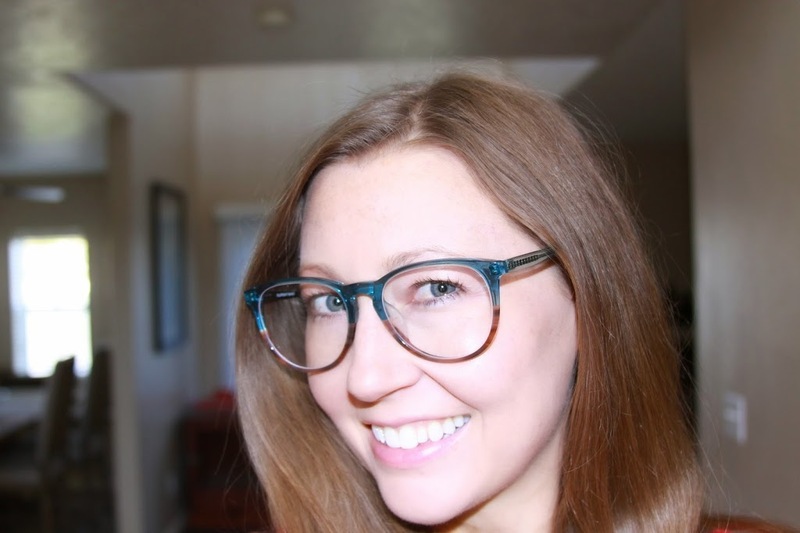 Last year I got some cat-eye frames from Firmoo, when the cat-eye trend came back last summer, and this year I found some pretty ombre blue and brown big frames. You can also get prescription sunnies from Firmoo too! I’ve tried a few pairs of their sunglasses over the years and have loved being able to throw them on when I need to go outside for a bit, and not have to worry about putting my contacts in first, but still be protected from the sun WHILE being able to still see perfectly! If you haven’t tried Firmoo glasses, you will be nothing short of impressed. 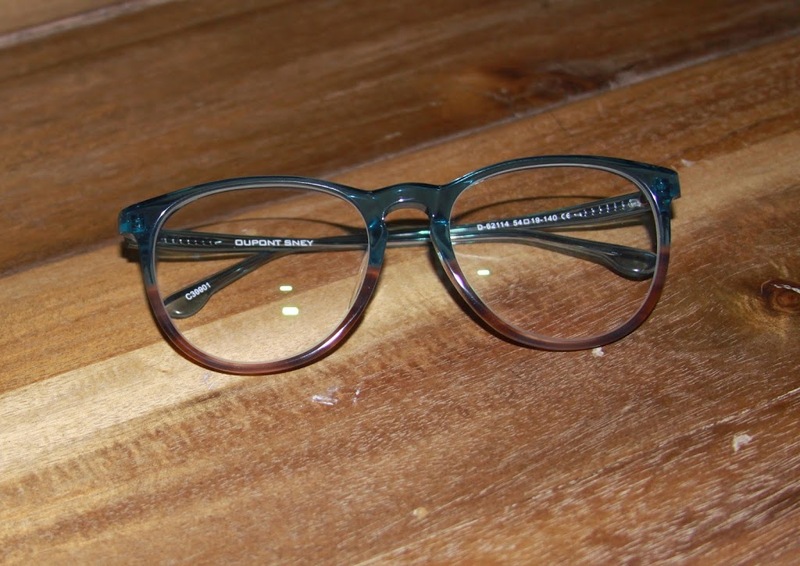 Although these glasses are super inexpensive, the high quality of the frames and lenses are truly impressive. I have been wearing their glasses for years now and have never had a pair break. I’m also able to see perfectly with my prescription too. They also offer awesome little add-ons, like ultralight lenses. (If you wear glasses all day, I’ve found this is the only way to go, especially when you love big framed glasses like I do!) You can get lots of great add-ons for next to nothing, such as anti-glare, water-resistant, anti-scratch, tinting, polarized and more! All at a very low cost! 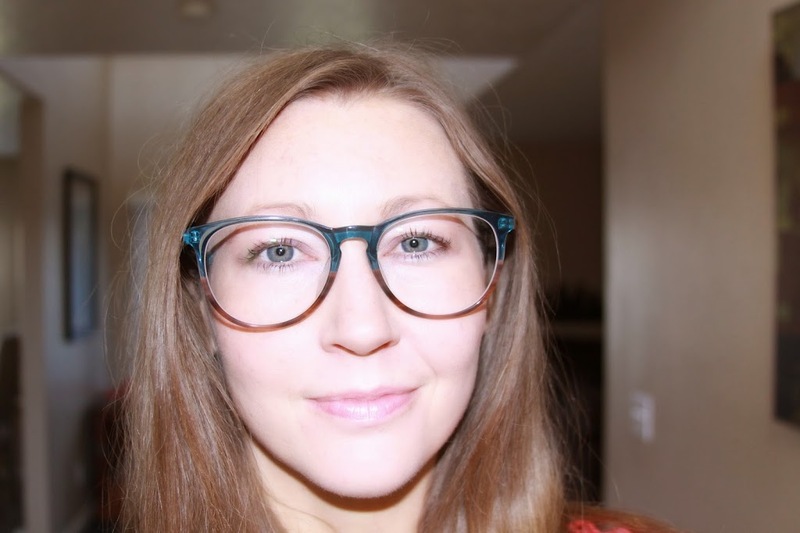 While shopping online can be hard for glasses, Firmoo lets you upload your photo to virtually try on their glasses. 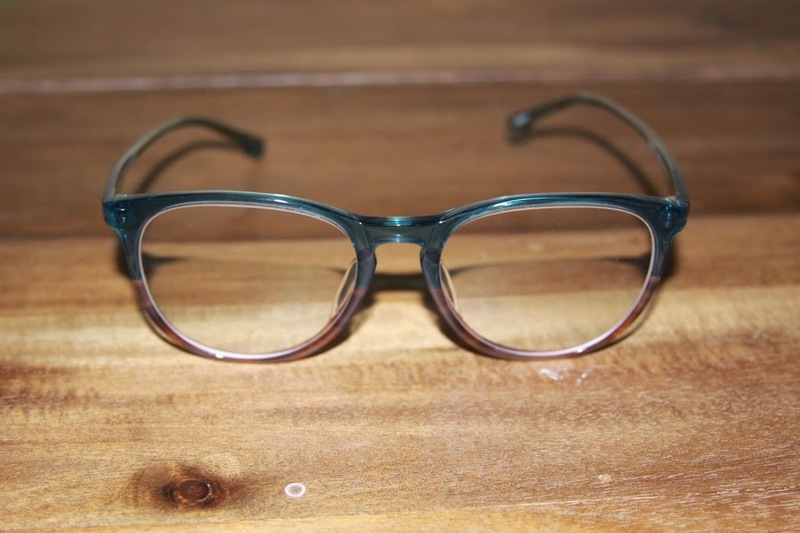 You can also see how they look on other customers as well as find customer reviews on all of their frames, so you can feel more confident about your selection. I absolutely love Firmoo.com and you can bet I will be shopping them for new frames for years to come! If you love changing up your style, Firmoo is the only way to go! You can easily stay on top of the trends, get the perfect frames and lenses to fit you and help you see your best, while also saving yourself lots of money at the same time! Each pair of glasses also comes with its own hard case, cleaning cloth, and repair kit. If you would like to learn more about Firmoo or shop for some lovely new glasses for yourself! Check them out today at Firmoo.com. * I was given this product for the purpose of review, however, all thoughts and opinions expressed in this post are solely my own. I only share reviews with my readers, I feel will be beneficial or informative in some way.